All hail the queen! 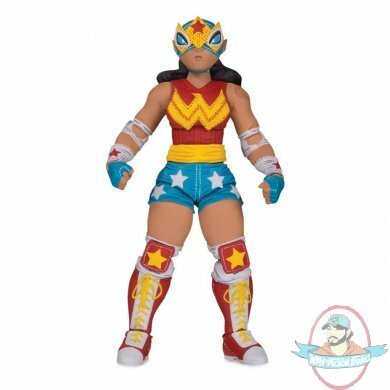 The luchadora known as Wonder Woman is a campeona in Mexico and around the world, traveling around the DC Luchaverse competing and winning various wrestling competitions. During each year of her multi-decade career, she leaves the tour for a month and heads to an undisclosed location-rumored to be mythical La Zona del Silencio off the Yucatan coast-to fight off challengers from her tribe. Only the victor of this competition gets the title "La reina del ring" and the legendary mask that accompanies it. While Wonder Woman is an overpowering force in the ring, most fans consider her technical skills to be her greatest asset. Her famous pin move, "La Diosa del Lazo," is rumored to inflict such fear in those in Wonder Woman's grasp that they will tell her their deepest secrets before submitting. This 7-inch action figure is made from PVC and features multiple articulation points for custom poses. Wonder Woman comes with extra hands and a lasso accessory.